crawlkill wrote: maybe this'll end up being a joke and not a meditation on death after all. sincerely hope so. My guess: nothing vile will happen. It's gonna be a day (and night?) at the beaches, in complete silence and togetherness. crawlkill wrote: maybe this'll end up being a joke and not a meditation on death after all. Who says it can't be both? I bet Randall does this so he can read this thread and chuckle to himself. Annihilist wrote: I bet Randall does this so he can read this thread and chuckle to himself. I like that Mr. Munroe has a properly protected stash of images. If it was just !. */comics/time%d+\.png!, we'd have teased the whole thing out already. Nay nay. A full 1024-bit masked number for us. Although, if someone wanted to write that script to try every 64-length hexadec number, compile all the images, and then try to arrange them in the correct order, you might win TWO internets for your effort. Last edited by Elrieve on Mon Mar 25, 2013 12:14 pm UTC, edited 1 time in total. I figured that since they appear to be by water (flat bit on the right) it's a play on "time and tide wait for no man". Here's a link to all of the images since I started indexing them (about 3 hrs ago). This is powered by a script that checks back for a new image every 5 minutes. Sometimes it receives a duplicate, so it throws those out rather than indexing them. This signature is written in Spanish while you don't look! yeah, having a border to the right side of the image is kind of...a relief? I'd thought he was just gonna walk off. because, you know, time. you have to leave people behind, can't stop there and stay with them kind of thing. now I'm not sure what to expect. Maybe the ocean/lake/body of water is going to recede and let him leave her/move on anyway? Oh Monday, no work for you today! If I refresh it continuously, I occasionally get a different image. Added the following in console in Chrome (After attaching jQuery to the page .. (which looks suspicious to the forum so you'll have to look that one up at stackoverflow.. Q# 7474354). This copies the current image to the bottom of the page every 30 seconds..
muzzle wrote: This has prompted me to listen to Pink Floyd's The Dark Side of the Moon again. Thanks Randal! Listen to "Dark Side of the Moon" while watching "The Wizard of Oz" backwards with a browser window open and pointing at this comic. He's standing at a lake/seafront. I'm pretty sure a shark will come and devour him. Then she will slit open the shark and help him out. Then they stitch up the shark and re-release him, because its an endangered species. I can't help thinking we're being set up for a big joke on April 1st. This might be a scene from a movie. recreated by stick figures, obviously, but still. Anyone has a film with a matching scene in mind? Hmm now I seem them both crouching together looking at the body of water. He looks like he's not moving, but she's about to stand up. Don't know if I missed any steps before this one, but I'm thinking it's new because my browser wouldn't load correctly right away. EDIT: Where I want this to go: they both get up, go home, and watch it rain outside. Last edited by SerMufasa on Mon Mar 25, 2013 1:40 pm UTC, edited 1 time in total. I loaded up xkcd, saw the same first frame as everyone, waited, looked at the mouseover text, waited a little more, looked at View Source and this script (http://imgs.xkcd.com/static/time06.min.js), and then after about a minute it changed to a frame of the girl laying by herself and the guy looking out over the water. I didn't know that wasn't what everyone saw until I came here, so I didn't take a screenshot. I made a quick thing to view everything thus far, and I'm working on making it auto-update. I've seen mention of the BTC string, but not what is below it. Is that new or have i just not looked that far down the page in a long time? I have one window open in IE and another in Firefox and they were showing different images. IE had the woman w/ both legs pulled up, Firefox had her w/ one leg extended. IE: both hands in his lap - Firefox: one arm behind him in a reclining position. Just refreshed and Firefox finally caught up w/ IE, it was ~10 minutes behind. Odd. Looking forward to seeing where this all leads. Huh, and I was staring at it for five minutes waiting for something to fly across the screen. I'd personally love if this turns out how one commenter here mentioned - continuing for months or even years, with trees growing, weather, people coming and going, etc. The first time wasn't your post being "blocked"; if you submit when new posts have been made since the moment you started posting, the forum first lets you know new posts have been made. This is normal and can happen often in active threads such as this one - it happened to me with this post. Which leads to the question of why "EDIT: Ninja'd" is still fairly common here, unless all participants manage to post at just about the same moment. I'm not sure why your post would get flagged as spam, however. I do know that your first five posts need moderator approval, but that might not be related. EDIT: You might have clicked Submit again within 5-20 seconds of your first click; that would likely do it. I'm not justifying it, just explaining it. Ideally, if your first Submit doesn't actually result in a post, the second shouldn't be able to trip the flood detection system. I had clicked it earlier on one of the characters, and the picture changed to, her still sitting on the hill in the same spot, and him walking away, down the hill. All I can think about is; What if xkcd had been ad funded? You've received something like 160 internets in the past couple of hours thanks to this. Nice job! I have one suggestion/twerk for it, though. Add a start frame (just the word BEGIN or something) so we can see when the loop is starting over more clearly. Sometimes the most recent frame is really similar to the start frames and it's hard to tell. I dont know how fast, as I look at the page every hour or so, but he definately moves away from the girl! What does that mean? Is it important? Why so slow? Looks like it opens a persistent connection to c.xkcd/stream/comic/time?method=EventSource , and it gets a JSON object from there which it uses when reloading the image every random(5,60) seconds. so that can't be good. She's messing up her hair! The drama! I was about to say we'd hit a loop point. But now Megan's shaking the sand off her hair, pretty sure they are at the beach now. Now her hair is messed up. What could that mean? In which xkcd is home to the most popular comic stream of all time. ...Even though the streamer has a FPS of .0007.
cegan09 wrote: I've seen mention of the BTC string, but not what is below it. Is that new or have i just not looked that far down the page in a long time? The algorithm talk is ancient. Some joke about strange google searches turning up XKCD...or something. Aubron wrote: In which xkcd is home to the most popular comic stream of all time. How many uterus-hertz is that? 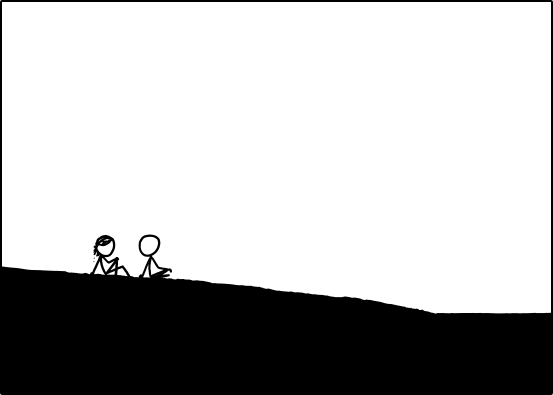 Hey guys, just so you know, we have all the comic images so far indexed by times at http://www.explainxkcd.com. Although the impact of all the people coming to our site from xkcd and refreshing constantly is really hurting. Oh the huge manatee, all the server errors. crawlkill wrote: The algorithm talk is ancient. Some joke about strange google searches turning up XKCD...or something. So I just haven't scrolled down the main page in a really long time. Thanks. I happened to notice it today, and wasn't sure if it was poking fun at everyone trying to break whatever code he's using for today's comic.